An excellent team performance wasn’t enough to help Lewes secure what would have been an impressive win against unbeaten Enfield Town, as two late goals in the space of a minute from substitute Billy Bricknell ensured the visitors returned to North London with a share of the spoils after an entertaining game at the Pan, reports Tom Harper. Darren Freeman made three changes to the side that beat Farnborough on penalties in the FA Cup first qualifying round replay on Wednesday, with Harry Reed, Luke Blewden and Nico Cotton replacing Stacey Freeman, Charlie Coppola and Ronnie Conlon in the starting line-up. With Frankie Chappell the only fit central defender available, Reed partnered him at the heart of the Lewes defence. There were no chances of note early on, with the first action of the game coming after just over ten minutes when Reed was injured following a clash of heads with visiting midfielder Sam Youngs at an Enfield corner. There was an eight-minute stoppage as Reed received treatment from physios from both clubs, before leaving the field on a stretcher to warm applause from everyone in the crowd. Charlie Coppola was introduced in his place, a change which saw Steve Brinkhurst move to the centre of defence and Michael Dome-Bemwin switch from central midfield to right-back. Despite this setback, the Rooks always looked dangerous in possession and were unfortunate to see the impressive Omarr Lawson volley over the bar from just inside the area at the end of an excellent passing move. Enfield came close to taking the lead themselves minutes later as Sam Chaney latched onto a Remi Sutton through-ball, but saw his powerful effort kept out by Lewis Carey at his near post. Lewes made the most of this by taking the lead after 42 minutes through Jonte Smith, who met a Luke Blewden cross from the right with a thumping header which flew past Joseph Wright in the visitor’s goal and into the bottom corner. The Rooks nearly doubled their lead within minutes, as Nico Cotton drew a smart save from Wright with a long-range strike at the end of another incisive move in midfield. Lewes continued to push for a second goal during the early stages of the second half, with James Hammond seeing a long-range effort just about fumbled behind for a corner by Wright. The Rooks finally scored the second goal their performance had deserved just before the hour, as Dan Rumens completely miscued his clearance as he attempted to defend a Leon Redwood cross from the left, and Coppola reacted quickest to meet the loose ball with a spectacular overhead kick which beat Wright and nestled in the bottom corner. Lewes were playing some of their best football of the season despite missing no fewer than five first-team players, and always looked capable of getting in behind the Enfield defence. The visitors were finding it difficult to create the chances required to get back into the game but did see Youngs have a far-post header from a dangerous Aaron Greene cross deflected behind, as they looked to ensure a nervy finale. Enfield did pull a goal back with nine minutes remaining, as Sutton flicked a long ball forward onto substitute Billy Bricknell, whose shot on the turn across Carey just had enough power to find its way into the far corner. Bricknell levelled the scores a minute later with a superb curling effort from the edge of the area, with the visitors now believing they could go on and win the game. There were no clear-cut chances for either side during the closing stages and although Enfield saw defender Sam Hatton sent off deep into stoppage time for an apparent stamp on Coppola, it was too late to hand Lewes any real initiative to find a winner. This was an impressive performance from Lewes, who coped well with several key players missing and will feel they should have won the game after going 2-0 up early in the second half before being pegged back by two late goals. The Rooks will hope to build on the positives of this performance when they travel to Kings Langley in the FA Cup second qualifying round next Saturday, kick-off at 3pm. 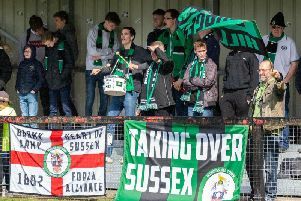 Lewes: Carey, Dome-Bemwin, Brinkhurst, Lawson, Chappell, Redwood, Hammond, Reed (Coppola 24), Smith, Blewden, Cotton. Unused Subs: Barclay, Gifford, Medlock, Headland. Enfield Town: Wright, Hatton, Sutton, Johnson (Adams 64), Rumens, McLean, Blackman, Youngs, Hope (Bricknell 72), Chaney (Sayoud 71), Greene.